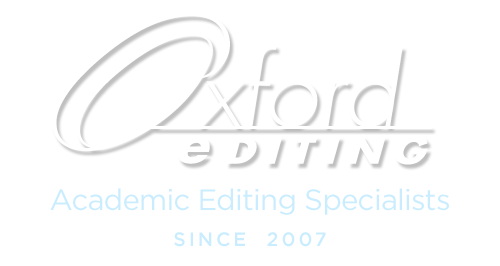 Oxford Editing’s academic editors edit academic journal articles, academic books, dissertations and theses, research and grant proposals, and CVs and other application materials. We also edit and proofread non-academic materials such as technical communications, and business texts, such as white papers and website copy, books targeting a popular or commercial audience, and fiction. A well-edited manuscript is the first step for getting your manuscript accepted. Our academic editors will check your journal guidelines to ensure that your article conforms to the academic writing standards and formatting requirements of your target journal. In addition to copy editing or proofreading we will check the structure of your document, making sure that paragraphs flow in a logical order and support your thesis or argument. We can also verify that you responded adequately to journal editor criticisms in a second round with journal reviewers. We provide a full range of book-editing services: substantive editing, copy editing, proofreading, document formatting, fact checking, citation checking, formatting (including legal citations), indexing, and writing assistance. We can also help you write an effective book proposal. Our dedicated book editors have edited multiple books, with one editing more than 100 books that were subsequently published. We work with new authors who are just turning a dissertation into a publishable book as well as well as published book authors. When our academic editors edit your dissertation or thesis, they will ensure that its structure meets the expectations of critical readers, such as your advisor or committee. Our academic editors can help you find the right word to strengthen your argument or point out areas where you need to cite a source or rewrite for clarity. Our editors can also perform just a light copy edit or proofread your paper if that is all is required. Our research proposal editors and grant writers can help you write a proposal that meets the requirements of your funder. For a substantive edit, the editor double-checks your proposal against the grantor’s guidelines to ensure that the proposal adequately fulfills content requirements, such as “Justify your research program by outlining X, Y, Z, stating your estimated costs for all.” The editor also polishs the writing as when doing a basic language edit. For a language edit, the editor checks the style guidelines to ensure header consistency and agreement with the style guidelines, spelling and abbreviations, word counts, and also edits the grammar, punctuation, syntax, and word choice. This edit would not include checking the text against the funder’s guidelines. We have edited a grant proposals in the sciences, for example, the National Institute of Health (NIH), the US Department of Health and Human Resources, and the European Research Council, as well as grant proposals for funding in the humanities, the arts, and international development. If you need grant-writing services, please inquire. Oxford Editing is not offering fiction editing at this time. Get More Information. If you would like more information about our editing and proofreading services, please feel free to email us. We prefer to receive all instructions in writing to avoid miscommunication. Click here to email us with any questions. Our academic editors can edit a wide range of topics and are familiar with the questions and terminology in their field of expertise and related fields. Our fields of expertise include the sciences, biomedical, political science, social science, humanities, and economics editing. We edit many papers in accounting and economics and are the preferred editors for the European Accounting Review. Biomedical editing is a particular strength for Oxford Editing as we have a large group of experienced biomedical editors, several with PhDs who are active scientists; several dedicated, full-time biomedical editors, with one who regularly writes for a journal and another who has served as an editor of a peer-reviewed biomedical journal. We have edited many articles that have been published in a wide range of biomedical journals; we regularly edit for the Journal of Internal Medicine (Wiley Blackwell). As you prepare your manuscript for editing and submission to your target journal, check some of the many online resources available for writers of biomedical manuscripts. For example, you might consider Dartmouth-Hitchcock’s Norris Cotton Cancer Center’s “Writing Peer-Reviewed Biomedical Manuscripts,” which lists multiple resources, or Dr. Angel Borja’s “11 steps to structuring a science paper editors will take seriously,” which offers steps to organizing your manuscript. Other resources are the “Recommendations” of the International Committee of Medical Journal Editors. Our humanities editors have published books and articles in their fields, which include history, Classics, Russian, German, French, and women’s studies. One of our engineering editors has an MS in Materials Science and Engineering, and our other engineering editor has a PhD in Engineering Science (Mechanical Engineering). We can format legal citations according to the citation systems of The Blue Book or the Oxford University Standard for Citation of Legal Authorities (OSCOLA), as needed. Our law editors can analyze your arguments knowledgeably and thoroughly, edit professionally, and help you cite authorities, legislation, and other legal materials accurately. 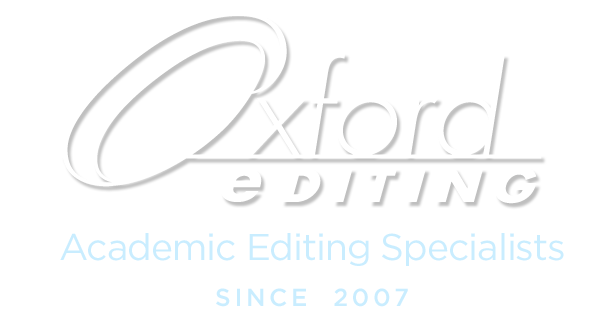 Oxford Editing has several accomplished editors who have advanced degrees in music. As professional editors, our editors can edit almost any discipline for a range of audiences. Below is a list of additional academic disciplines we can usually do a language edit for.